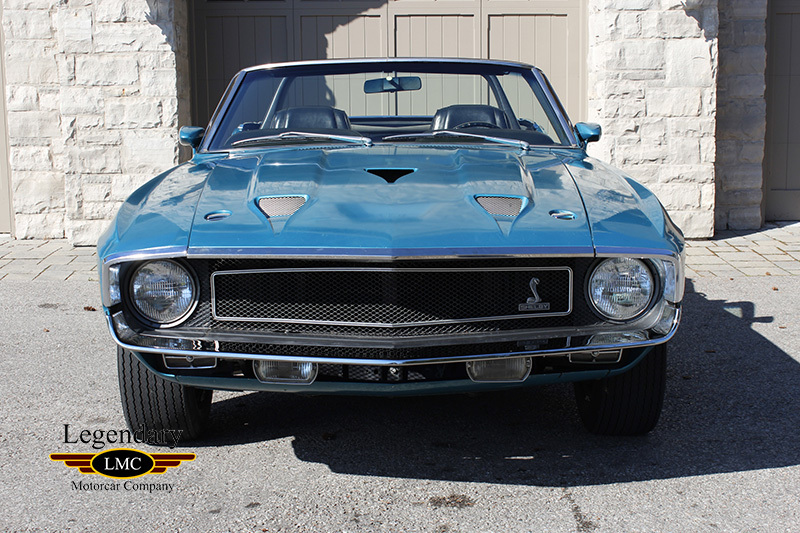 Click any thumbnail below to display the 1969 Ford Mustang Shelby GT350 slide show. 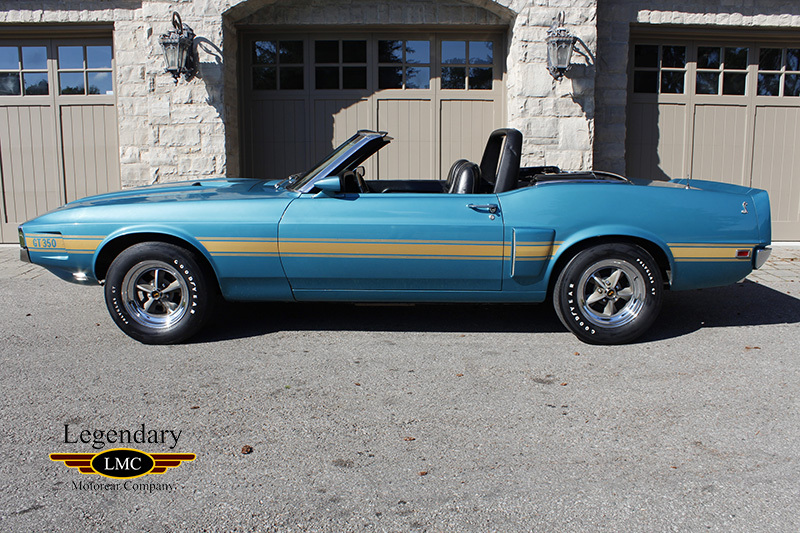 LMC is very proud to offer for sale this prized original 1969 Shelby GT350 Convertible. 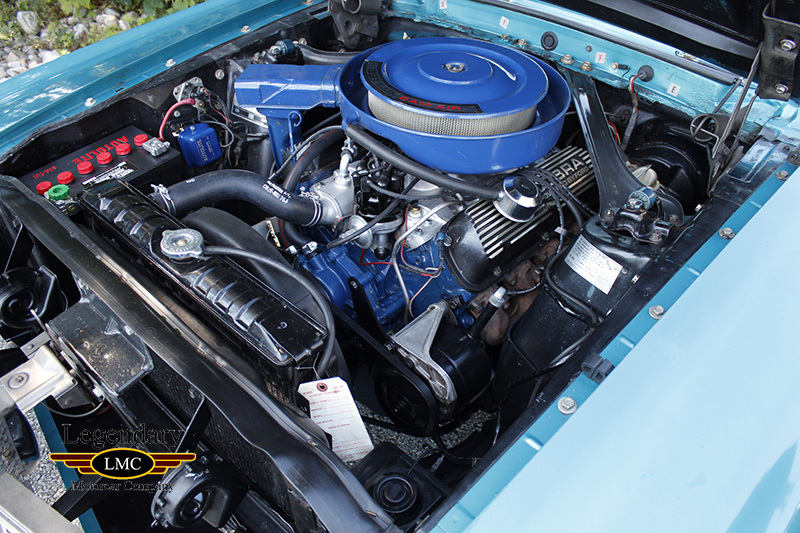 The next generation Shelby Mustang GTs for 1969 saw the GT350 equipped with a 351 cubic-inch V8 and the GT500 with Ford’s mega 428 block power plant. 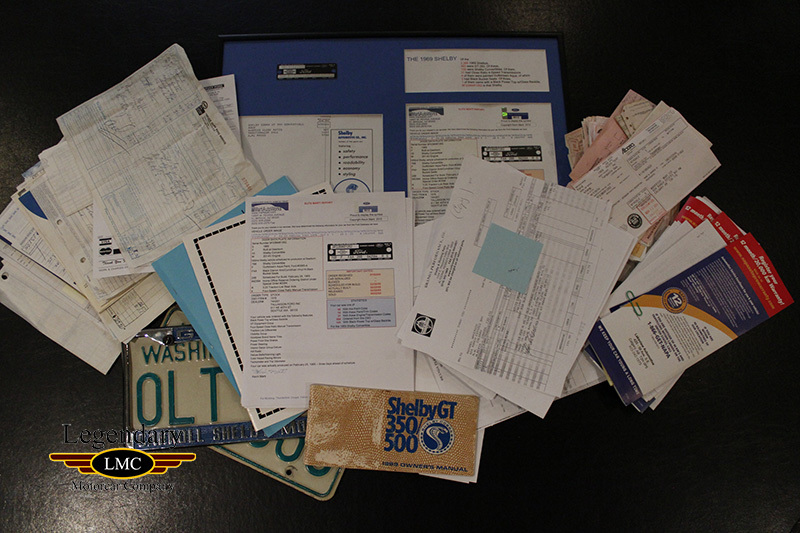 Upscale, professional and well off, the buyers Shelby and Ford targeted wanted performance at their disposal but, also demanded their performance cars be comfortable and reliable daily drivers. 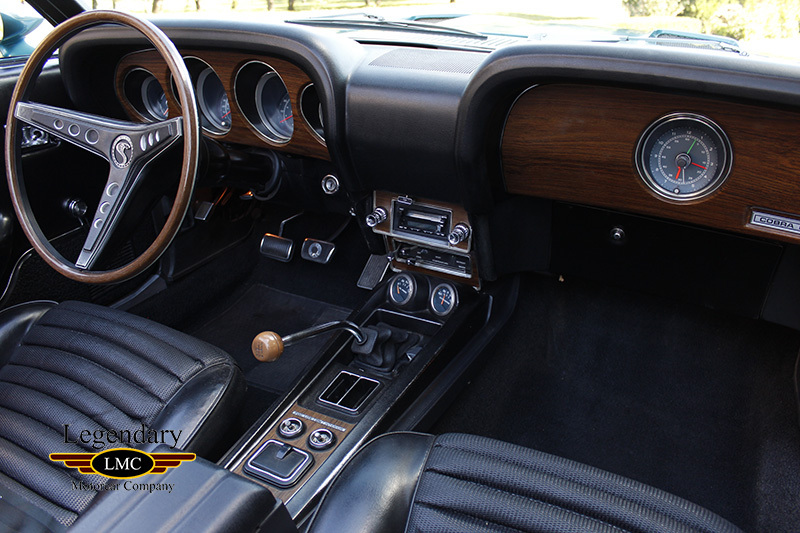 The 1969 model year received an extensive face lift with the body increasing in length by 4 inches. 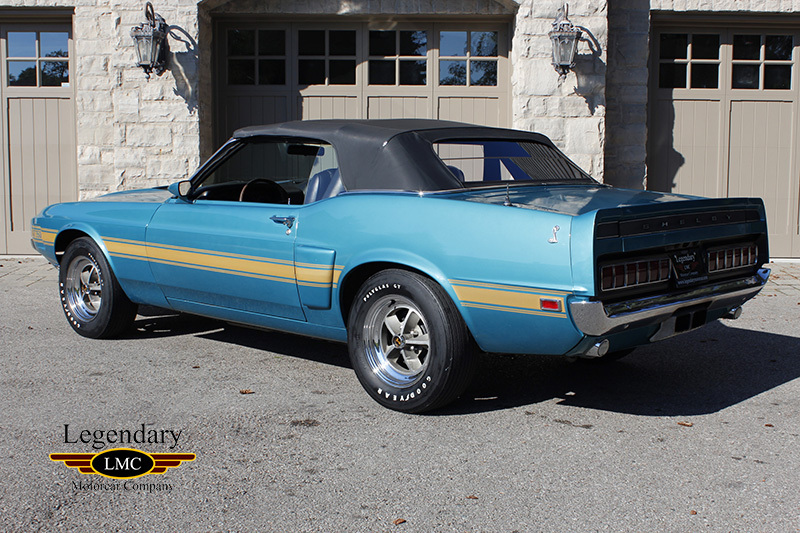 The new exterior look for 1969 was long and low with racy styling having looks that seems to dare anything on the road to try and challenge it. These Shelby’s were known for racing car handling in the day with lots of power to the asphalt and the suspension and brakes to take a corner at speed and ride right through the curve. 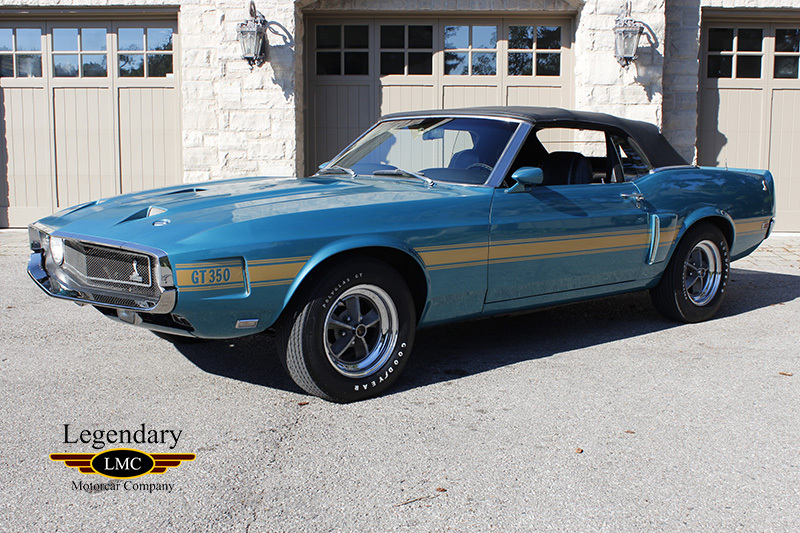 In 1969, there were only 194 GT350 Convertibles that rolled off the assembly line compared to the 335 GT500 Convertibles. 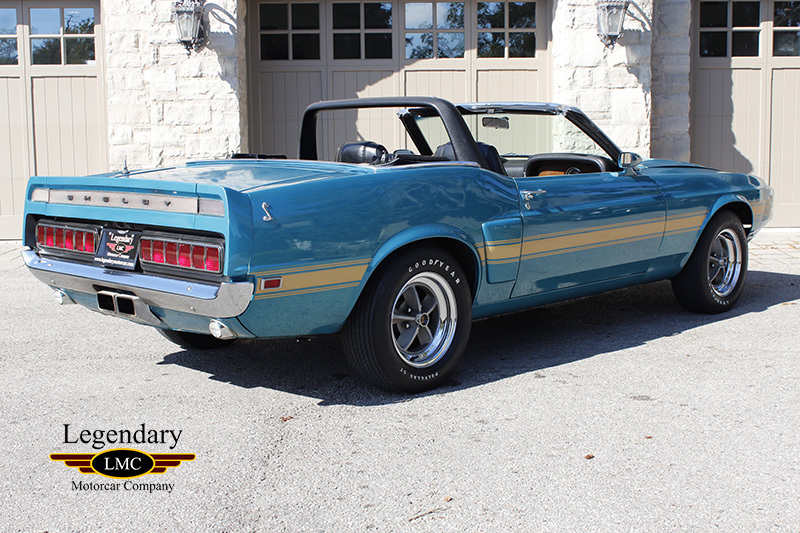 This makes the GT350 much rarer than the GT500 in the opinion of many Shelby fans. 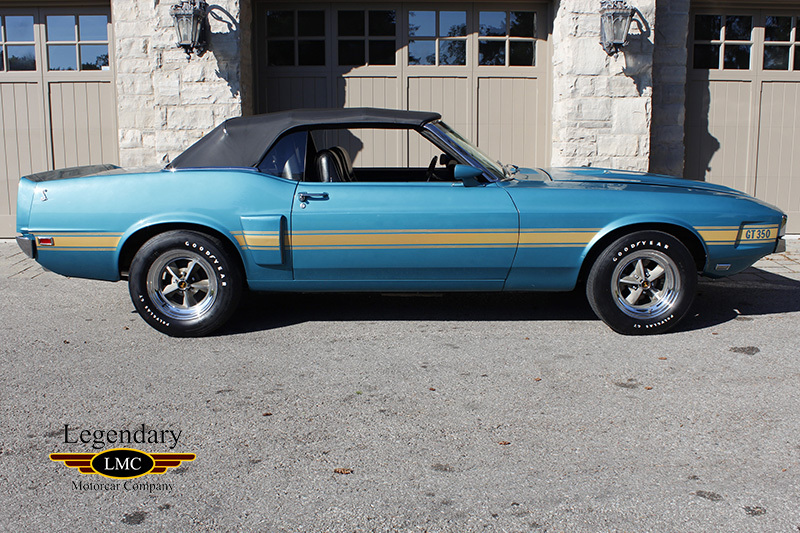 This Shelby was built at the Dearborn Assembly Line on February 28, 1969. Originally shipped/delivered to Tallakson Ford in Seattle, Washington where is was sold to the original owner Mrs. Thompson May 3rd, 1969. Turn the chrome button hood locks and lift the functional vented hood and underneath is a tidy original engine bay with the Numbers Matching M-Code 351 power plant that defined this model year of Shelby Mustangs. 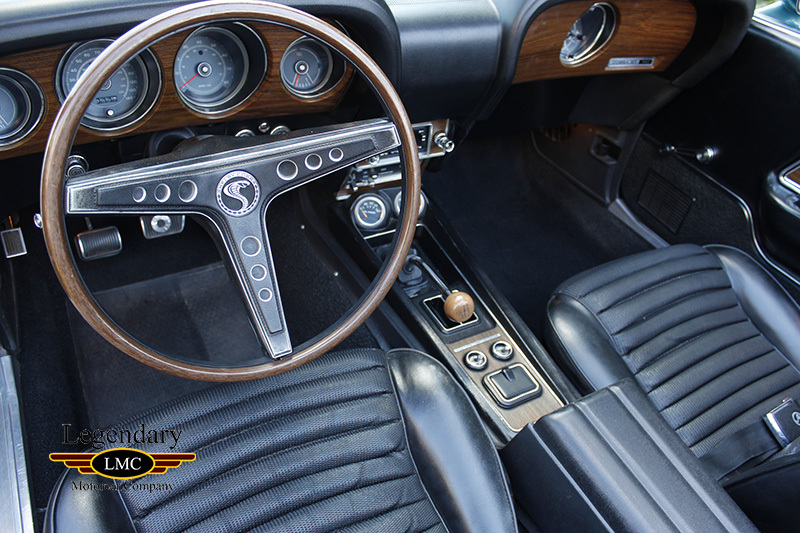 This Shelby has the rare and very desirable 4-Speed Close Ratio Manual Transmission sporting the wood knob shifter mounted in its console. This is linked up to the 3.25 Traction-Lok Axle. Goodyear Polyglas raised letter tires mounted on Shelby five spoke chrome wheels drives this machine. 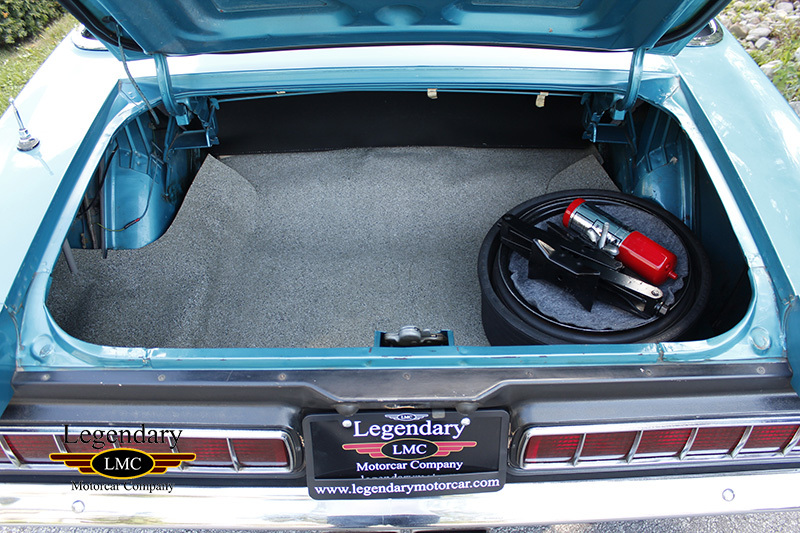 Power exits through two rectangular ports located in the center under the license plate out the back. 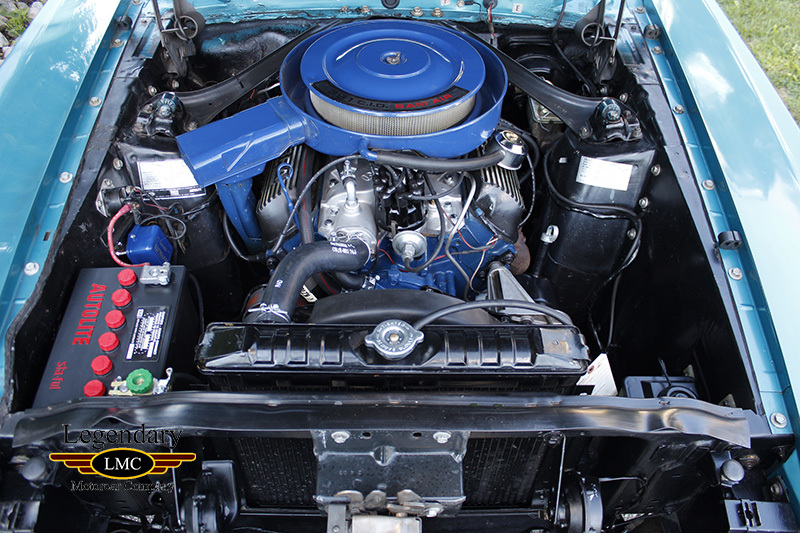 Power front disc, rear drum brakes and power steering were mandatory options. 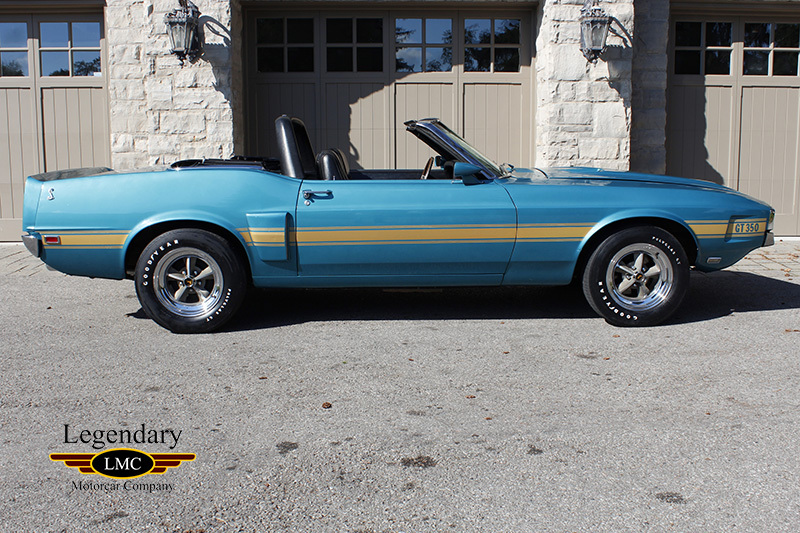 This Shelby creates a fantastic drive and original experience that only a Numbers Matching original car can provide. 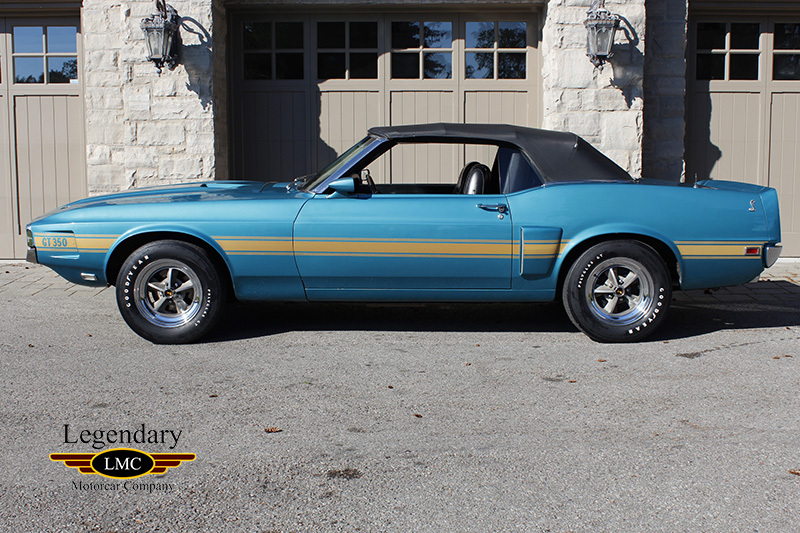 The exterior of the car looks wonderful having never been restored and it's a great original survivor. 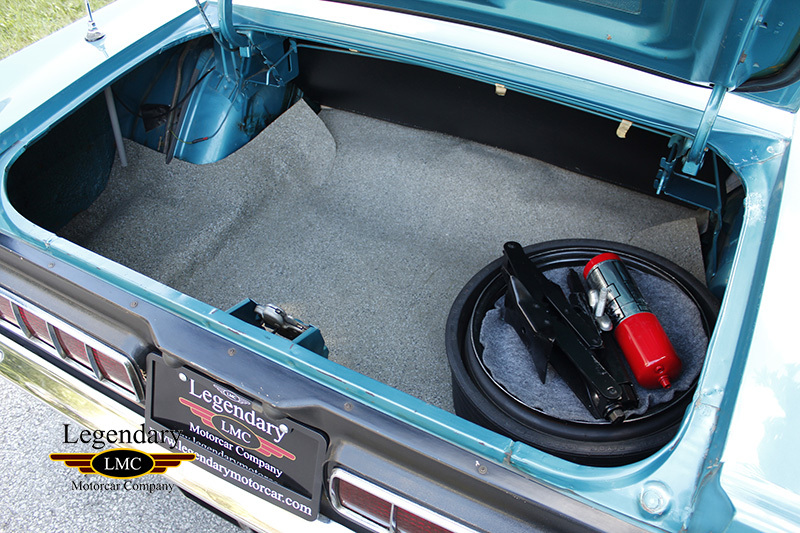 Finished in the factory applied Gulfstream Aqua paint and complemented by the Black Power Soft Top. 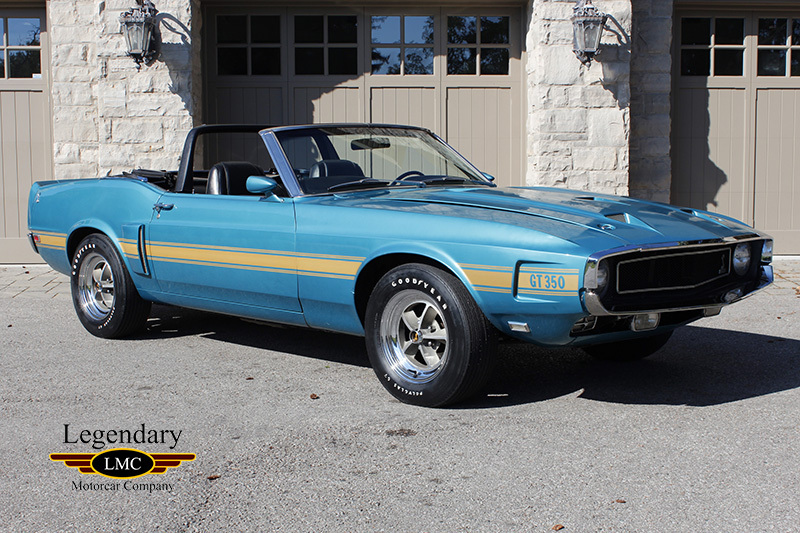 This Gulfstream Aqua Shelby GT350 Convertible is a true documented 1 of 1 built. 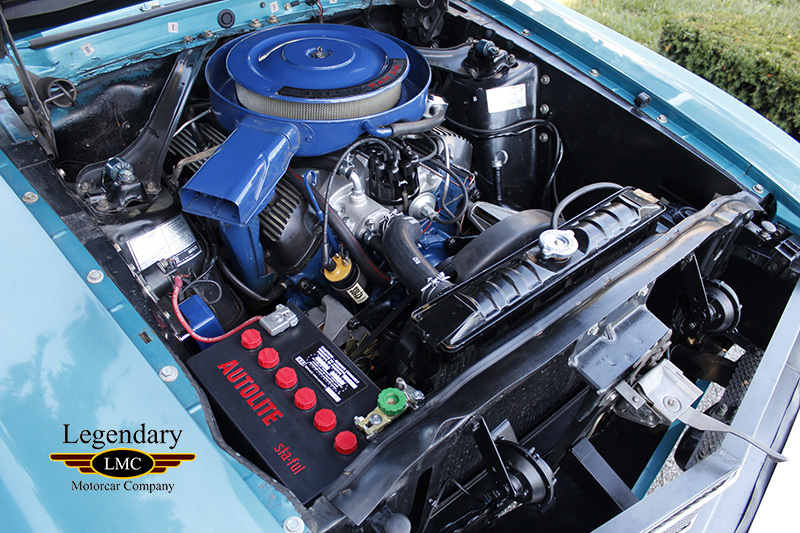 As an original unrestored survivor, the first impression is the unbelievable condition this vehicle is in for being 48 years old. 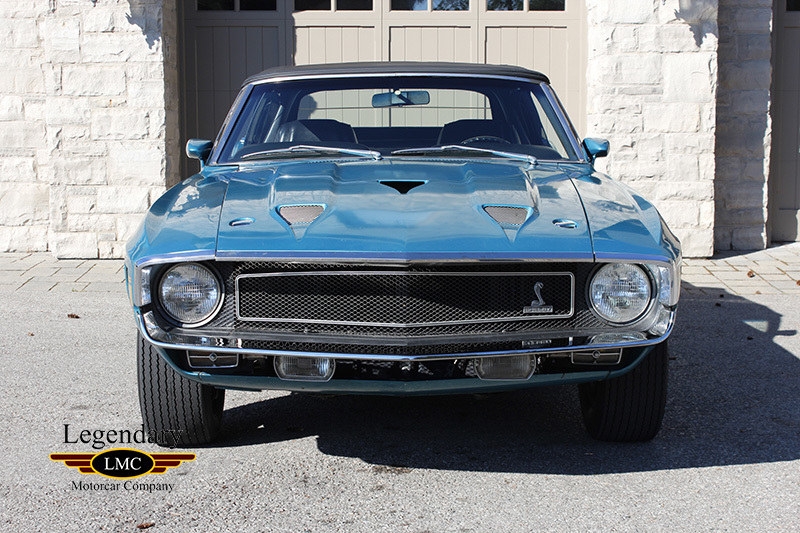 Up front, the dual headlights sit within the full width/deep recessed black grill of the Shelby with the Snake in the right corner. There are dual body tone racing mirrors with the Driver Remote Mirror. 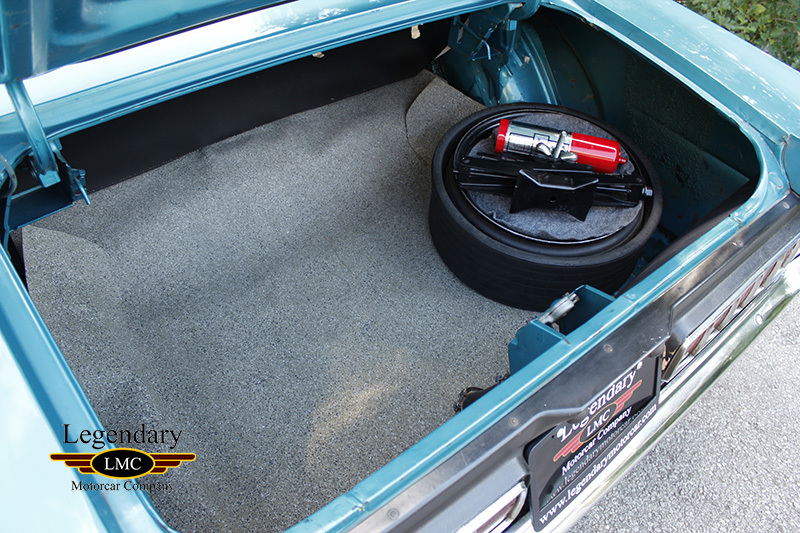 The Shelby Snake is mounted on the side roof panel just behind the rear quarter window and just above the large side Scoop. 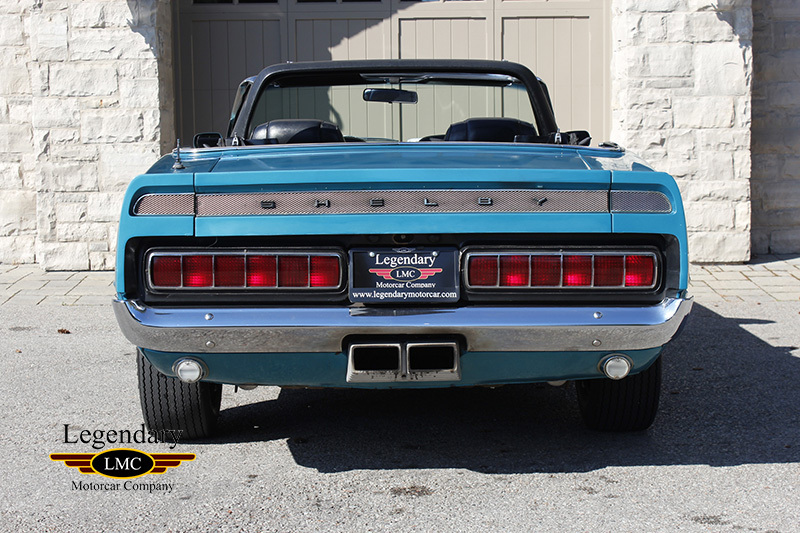 Out back is a contoured body spoiler that has a Black recessed full-width insert having the Shelby name in chrome letters. 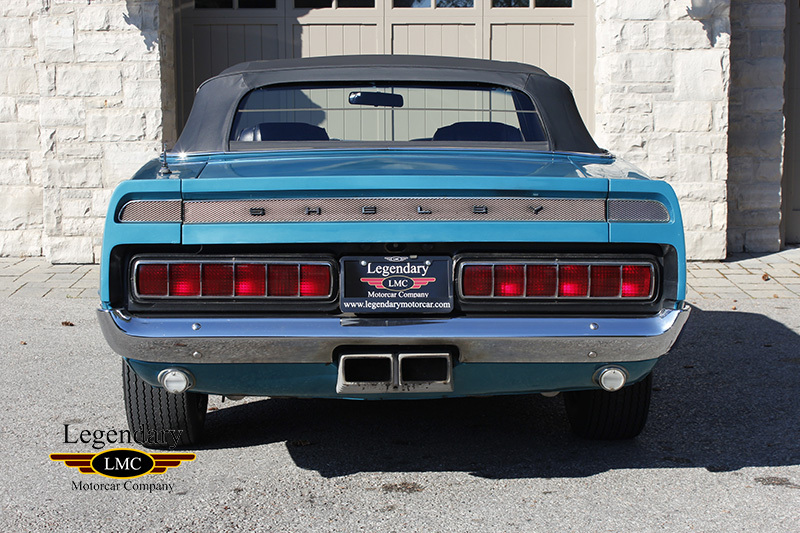 Below the rear spoiler is the full width tail lights with the backup lights under the bumper in the rear panel. 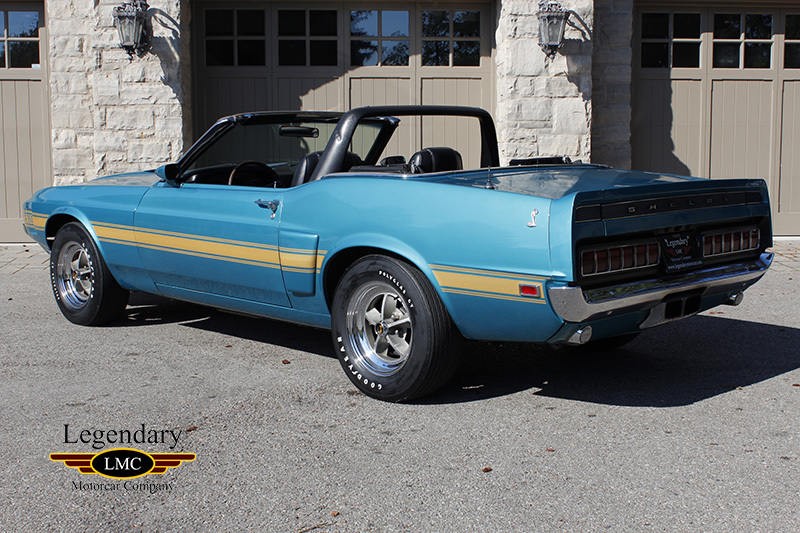 The undercarriage is factory original down to the grease pencil markings, factory shims with masking tape, factory applied paint dabs This is a classic Shelby with the overall look of a respected muscle machine proudly showing off the years of originality. One would be hard pressed to find one like it, let alone in this color combination. 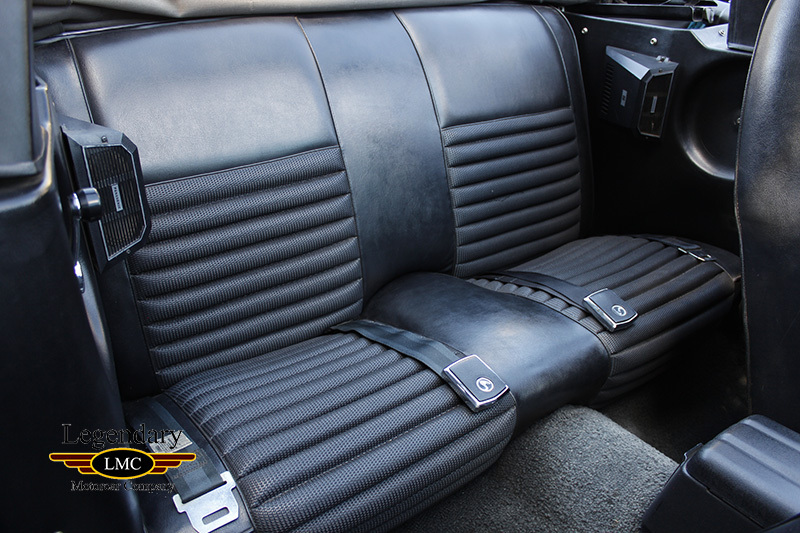 The original interior of Black Clarion Knit/Corinthian Vinyl, Code 3A, has excellent seat surfaces and overall great unrestored condition ready to be fully enjoyed by the next Shelby enthusiast. 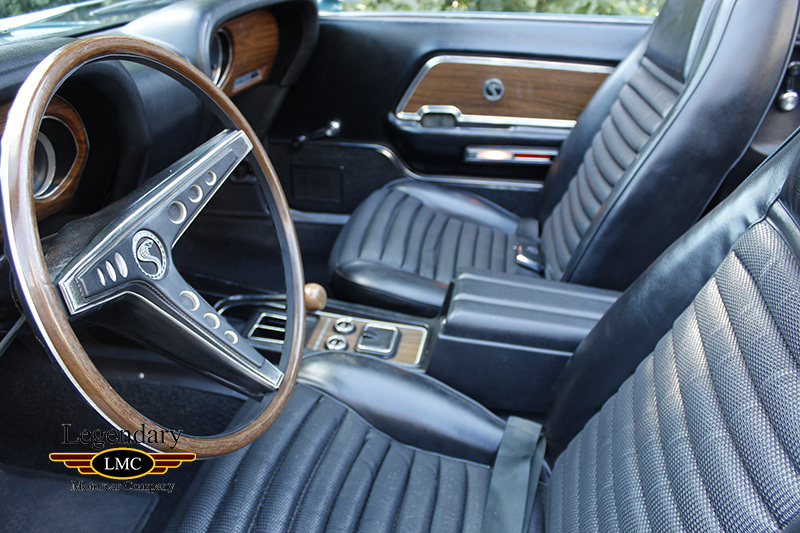 The bucket seats are in very good condition and the wood steering wheel is in surprisingly good condition. 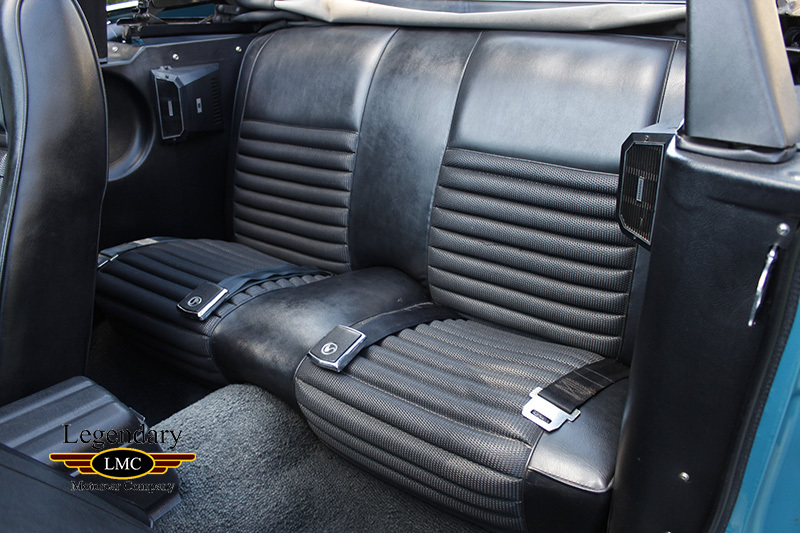 The padded dash top is in remarkable shape for the years while the chrome on the dash shows little age. 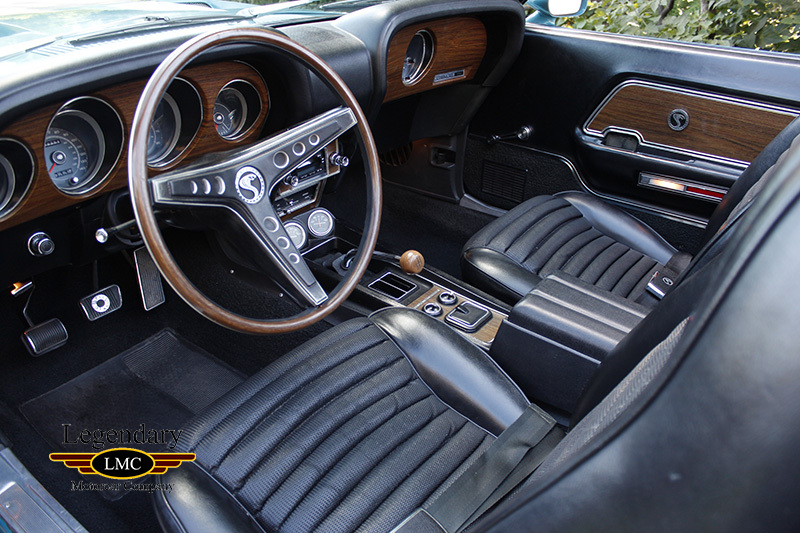 Other conveniences of the day include an AM Radio, Tach, Clock, Driver-Remote Chrome Mirror as well as an Oil/Amp gauges mounted under the dash in front of the shifter. 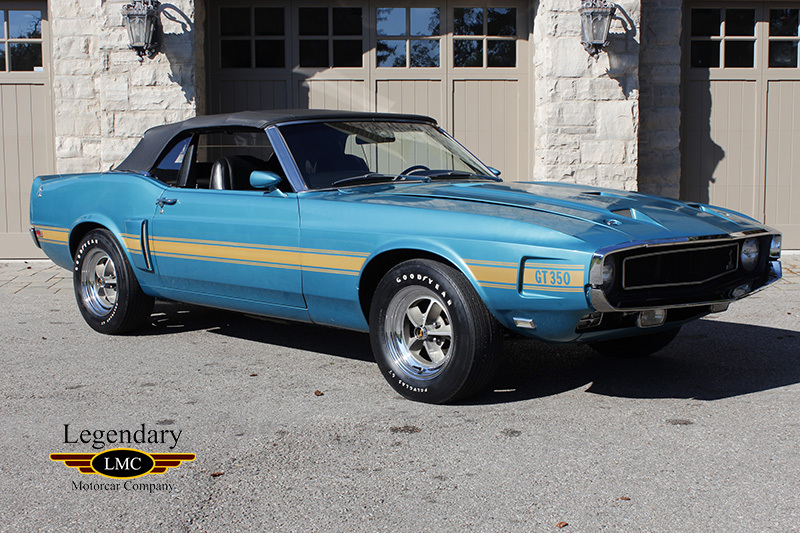 This original Shelby has extensive documentation including Owner’s Manual, Bill of Sale, Dealer Invoice, Service Documents, registrations going back to virtually new. 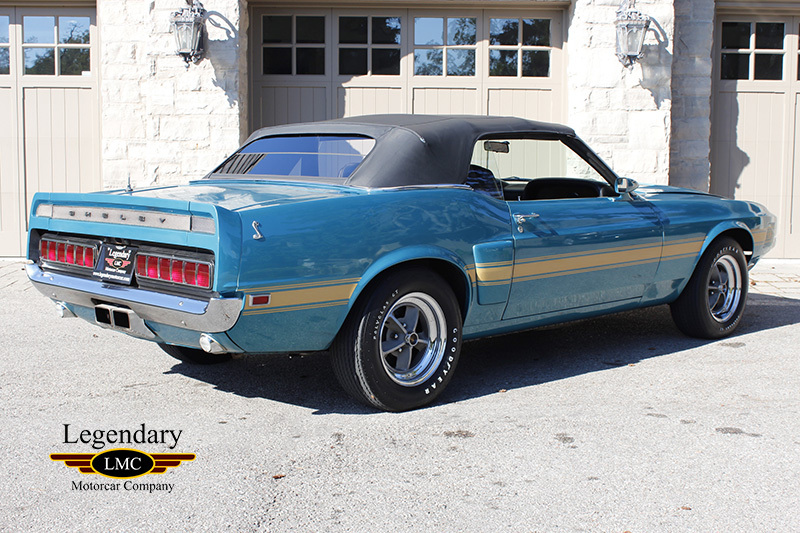 This Shelby is a virtual time capsule being the closest experience to owning a new Shelby GT350 Convertible back in 1969. 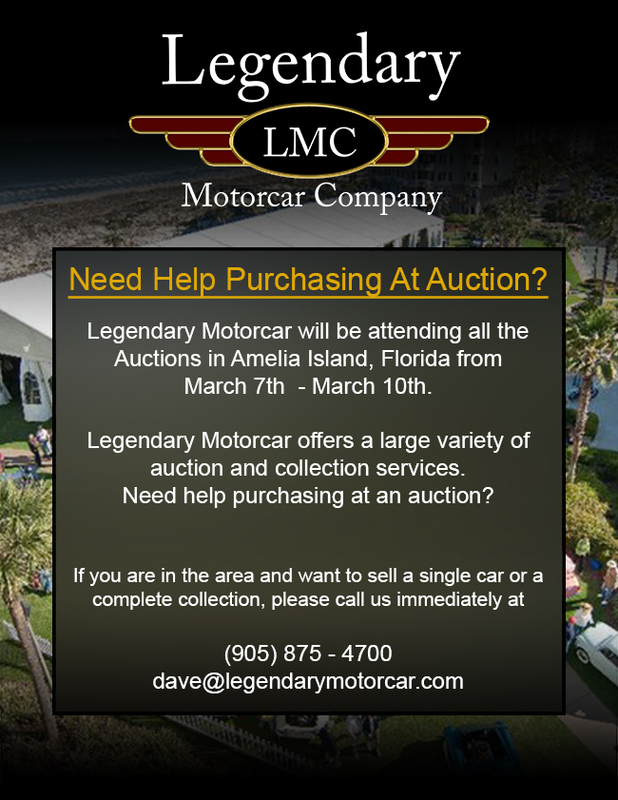 There are only handful left of these in all original condition making this one stand out in a sea of restored cars. 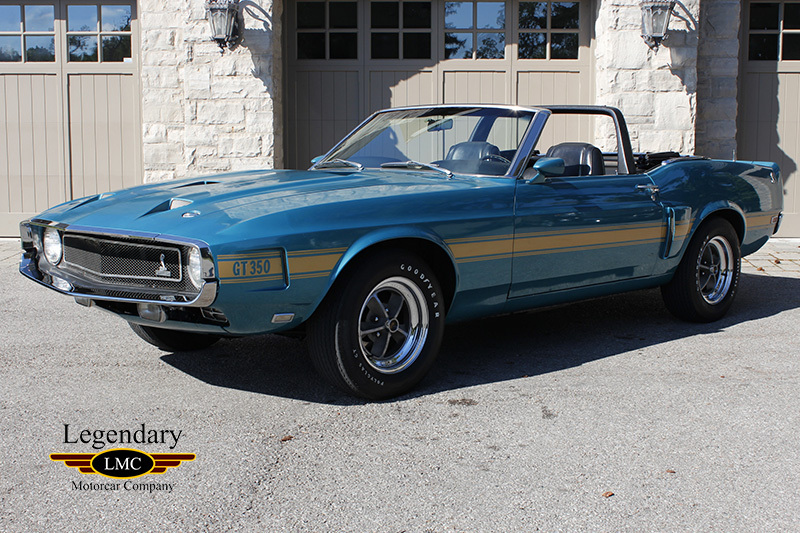 In summary, this car in particular is the one to buy if you have been looking for a true original, well maintained, never restored fully documented 1 of 1 1969 Shelby GT350 Convertible. 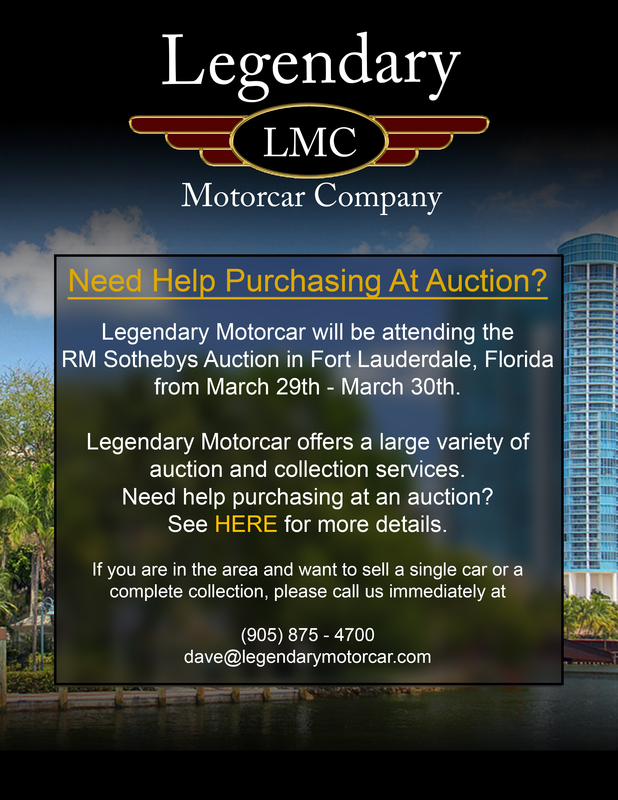 Legendary-Motorcar-Company-Ltd-2017-044 Ford 1969 Ford Mustang Shelby GT350 2017-044 0 Legendary Motorcar Company Ltd.